While choosing images for our supplemental image set for Janson’s 8th edition of the History of Art, I came across one of my “holy cow” moments when looking at the Gothic architecture of Gloucester Cathedral in England. I’m really not a huge fan of Gothic architecture, especially since most art history books treat the subject as if the style only came to fruition in France. I find English Gothic very interesting. Although it was naturally a derivative of the French style, there are subtle differences in emphasis. Always on the look-out for drop-dead gorgeous details of architecture, I hit the brakes when I saw this ambulatory from Gloucester. What a gorgeous set of fan vaults! Let’s talk a little about fan vaults. A vault is a masonry roof or ceiling based on the principle of the arch. The main section of medieval churches, the nave, was usually covered by a repeating series of vaults, much as the barrel vault is a continuous row of arches forming a rounded vault. The vaults of Gloucester’s cathedral cloister are gorgeous fan vaults. The key element to vaults is the rib, a projecting arch which carries the vault. In a fan vault, the ribs fan out from the piers supporting the vault. The ambulatory of a cloister connected to a cathedral is the section detached from the main body of the church where monks could meditate in peace. The fan vaults in Gloucester’s ambulatory are further decorated with ribs connecting each rib of the fan. The end effect of this beautiful ambulatory is one of an elegant Rhythm, one of the Principles of Design. Let’s throw in Pattern, Balance, and Unity as further Principles of Design evident in this space. Just for good measure, let’s mention some of the Elements of Design obvious here: Line Texture, and (flowing) Space. During the mid-12th century, with the rise of a strong monarchy, France became a center of artistic activity, including architecture. As Church architecture evolved from Romanesque to Gothic, it became increasingly refined and structurally sophisticated. In Romanesque architecture, walls are thick and massive, and in Gothic, thin and light. The Gothic pointed arch can not only support more weight than the rounded Romanesque one, but it can also span a variety of bay shapes. The Gothic church, with tall, slender columns, piers, windows and arches, is more vertical than the Romanesque. The new Gothic architecture did not have an immediate impact outside of northern France. Beginning about 1174 with Canterbury, English churches began to adopt Gothic elements, but they placed less stress on verticality. Some of the unique features of English Gothic churches include: screen-type west facades, main portal on the south side of the nave, and square apses. 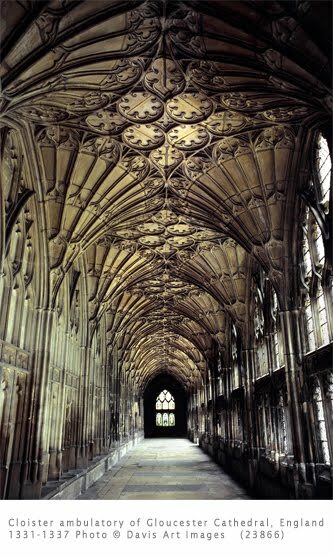 The fan vaults of the Gloucester Cathedral cloister are among the most famous in Europe, and certainly the most famous in England next to those at King’s College Chapel in Cambridge (which is actually Late Gothic [15th century]).